If you’ve seen nitrogen (N) deficiency symptoms in corn popping up in fields across Minnesota, you’re not alone. 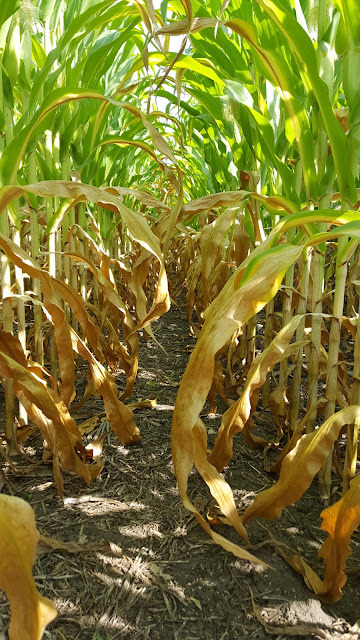 Crops in the past couple weeks have begun to show substantial N deficiency symptoms around the R3-R4 stages. We had a lot of moisture early in the season that may have prevented deep rooting, and potentially led to N loss through denitrification. In addition, some growers were prevented from getting into the field to apply N splits. One final factor is that plants now have a big sink – the cob – causing N to mobilize within the plant. These factors, coupled with a recent spell of fairly dry and hot conditions have led to the current conditions. Between fertilizer and mineralization, the corn plant will have enough N to stay green under normal conditions. This makes it hard to detect deficiency either visually or with sensors, especially early in the season when corn does not need a lot of N. As the season progresses, plants need more N as they accumulate dry matter in the grain. Given this year’s circumstances, there are many situations where the need has surpassed the supply. Unfortunately, this condition developed too late in the season to be able to correct the problem. Currently the plant is translocating N from vegetative tissues to the grain. If the entire plant is staying green, it’s a good indication that you applied excessive N. It is normal for the lower leaves to turn yellow and fall off, but if this extends all the way to the ear, you will likely see a reduction in yield. Areas where the whole plant is yellowing, correspond to severe N deficiency, most likely from denitrification. These spots are mostly affected by poor drainage, so not much could have been done in terms of management to prevent it. Be sure you do not confuse leaf diseases or other nutrients (like sulfur), which frequently occur toward the top of the plant, with N deficiency, which will manifest itself from the ground up. So what can you do? At this point, do not add N. Research has shown that it is too late in the season to have an effect on yield. The soil will, however, continue to mineralize N as long as there are warm temperatures and adequate soil moisture. More rain will help some of this N to reach the grain. If you are concerned about the N status of your crop, you can use the basal stalk nitrate test. While this test does not indicate what the right amount of N fertilizer should have been, it will tell you approximately whether the crop had adequate, deficient or excessive amounts of N.